The New Yorker is a handsome, fold-out bed that features 100% real wood and a memory foam mattress. This bed comes in Queen size only. 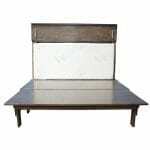 Categories: Beds, Cabinet Beds Tags: Bamboo, cabinet bed, canadian, contemporary, Futon Land, New Yorker Brand: CabinetBed Inc. 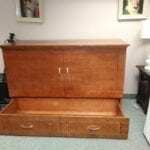 The New Yorker Cabinet Bed is a good choice for an extra bed for overnight guests. Why devote your space to a bed you rarely use? The innovative New Yorker is perfect. 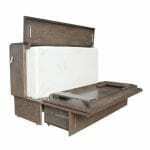 This is the newest bed in the Cabinet Bed USA line up. Whether the bed is open or closed you can use the cabinet as an HD TV stand and can support flat screen TV’s up t0 80 inches. The TV will not need to be moved even when the bed is set up for sleep. The bed can sit under a window and can be moved around the room. It does not need to attach to your wall unlike a traditional Murphy Bed. A built in USB port is standard on the New Yorker. 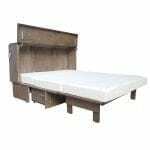 The 59″ oversized storage drawer will hold all your linens making this bed both compact and self sustaining. 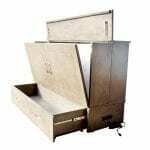 The drawer box can support up to 200 pounds. This drawer is attached to the bed and opens with full extension glides. Levelers are installed on the New Yorker. Regardless of your flooring your drawer will open and close with ease. A unique feature of this bed is the fold back sides. 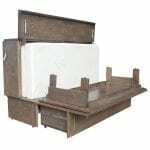 The solid sleep surface is a substantial platform that can hold up to 600 pounds. 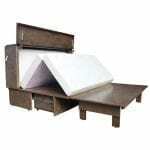 Use standard queen size linens on our Cabinet Bed products. 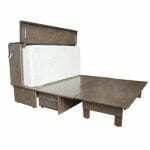 Store the bed made up and ready for sleep or store your linens in the roomy storage drawer. This bed is simple to use. One person can set up the bed in under 30 seconds. 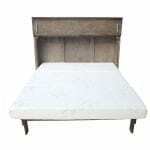 The New Yorker bed comes with the tri fold cool gel top memory foam mattress designed specially for this bed. The special gel top layer keeps you cool and comfy all night long. The New Yorker Bed is the only import on the market that comes standard with the CertiPur-US accredited mattress. 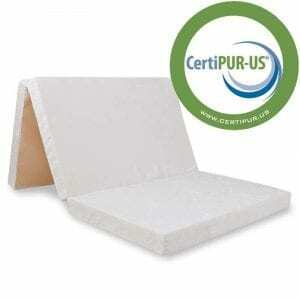 When you see the CertiPUR-US® seal, you can be confident that the flexible polyurethane foam inside meets CertiPUR-US® standards for content, emissions, and durability, and has been analyzed by independent, accredited testing laboratories. The bamboo cover is both removable and washable. Bamboo has many qualities especially as a renewable resource. We love it because it’s soft like cashmere, naturally hypo-allergenic, antibacterial, antifungal, odor resistant, and cooler in the summer and warmer in the winter. This bamboo cover can easily be removed with it’s strong zipper cover and launders beautifully. The bed is great and we love it! You can definitely add me to your list of happy customers. The installation was perfect and the guys were really nice. I am completely satisfied. I’ve gotten lots of compliments on your product. Thanks again. We have slept in the bed for 3 nights and find it very comfortable! The size is just right for the limited space we have in that room, and the delivery guys did a good job assembling it, following the instruction sheet that came with the bed. Again, we love the bed. 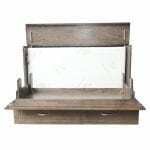 It is comfortable, it stows away out of the way when are using it, and it is easy enough to pull out of and return to its cabinet.